Enormous earthen cracks have emerged around Mai Mahiu, an area in Kenya’s Rift Valley Province, making people homeless and disrupting transportation. What is a rift valley? Browse our reference resource for some help. A rift valley is a lowland region that forms where Earth’s tectonic plates move apart, or rift. Rift valleys differ from river valleys and glacial valleys in that they are created by tectonic activity and not the process of erosion. The most well-known rift valley on Earth is probably the so-called “Great Rift Valley System” which stretches from the Middle East in the north to Mozambique in the south. The area is geologically active, and features volcanoes, hot springs, geysers, and frequent earthquakes. Mai Mahiu and the Rift Valley Province are part of the East African Rift, the southern portion of the Great Rift Valley. Specifically, the Kenyan rift is part of the Gregory Rift, a series of faults stretching from the Gulf of Aden to Mount Kilimanjaro. Along the East African Rift, the continent of Africa is in the long, long process of splitting in two. The African plate, sometimes called the Nubian plate, carries most of the continent, while the smaller Somali plate carries the Horn of Africa. If geologists and seismologists agree that the Great Rift Valley is tearing Africa apart (and they do! ), and that Kenya is right in the middle of this rift (and it is!) … why do they doubt the big cracks in Kenya are associated with the rift? Watch the video and read through the great Guardian article for some help. “The crack is not continuous, with soil ‘bridges’ in between.” Rifting would usually result in a single crack. “There are also no clear escarpments and the land is flat on either side of the crack.” Escarpments are steep slopes that form on either side of a rift. The Mai Mahiu area has not experienced major or even moderate earthquakes recently. Rifting is almost always associated with seismic or volcanic activity. Satellite radar data regularly record tectonic activity in the area, and have not recorded any unusual disruptions. If the cracks weren’t caused by the Great Rift Valley, how did they form? Watch the video (skip to about 1:57) or browse the first question in this resource for some help. Erosion. The cracks in Kenya are not faults, they’re fissures. Earth fissures are associated with land subsidence, the process of a large area of land lowering in elevation. LinkedIn: Is Africa splitting in two? Yes… and no. Popular Mechanics: Does This Massive Crack in the Earth Mean We’re Getting a Brand-New Continent? 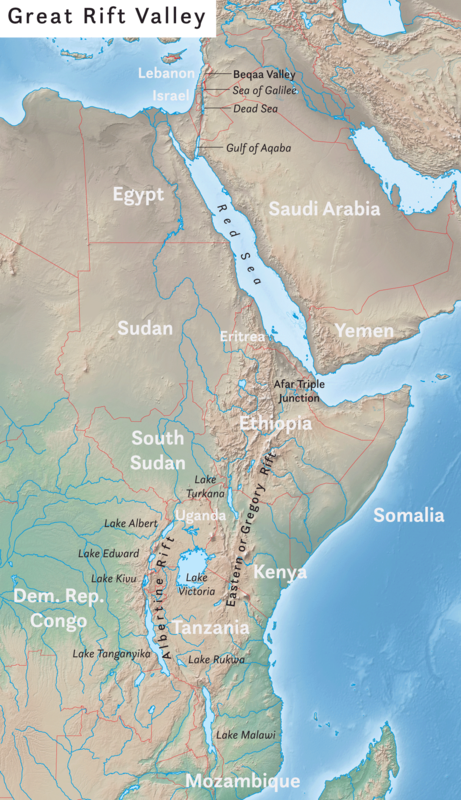 Nat Geo: What is a rift valley? Nat Geo: What is erosion?